When Amish Rebecca Kauffman gains custody of her English nieces, ?blended family? takes on a whole new meaning. She's always dreamed of being a parent, but the clash of cultures threatens to tear her home, including her marriage, apart. Rebecca Kauffman's tranquil Old Order Amish life is transformed when she suddenly becomes guardian to f her two teenage nieces after her English sister and brother-in-law are killed in an automobile accident. Instant motherhood, after years of unsuccessful attempts to conceive a child of her own, is both a joy and a heartache. Rebecca struggles to give the teenage girls the guidance they need as well as fulfill her duties to Daniel as an Amish wife. Rebellious Jessica is resistant to Amish ways and constantly in trouble with the community. Younger sister Lindsay is caught in the middle, and the strain between Rebecca and Daniel mounts as Jessica's rebellion escalates. Instead of the beautiful family life she dreamed of creating for her nieces, Rebecca is frustrated by her new role and begins to question her place in the Amish community, her marriage, and her faith in God. Take a trip to Bird-in-Hand, Pennsylvania, where you'll meet the women of the Kauffman Amish Bakery in Lancaster County. As each woman's story unfolds, you will share in her heartaches, trials, joys, dreams ... and secrets. You'll discover how the simplicity of the Amish lifestyle can clash with the English way of life?and the decisions and consequences that follow. Most importantly, you will be encouraged by the hope and faith of these women, and the importance they place on their families. 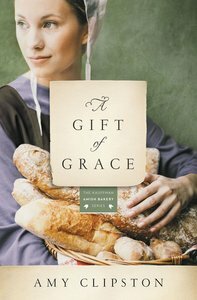 About "A Gift of Grace (#01 in Kauffman Amish Bakery Series)"
Order now to secure your copy when our stock arrives. Other edition is available. 9780310343998 0 Available. Expected to ship in 6 to 7 weeks from Australia. Rebecca Kauffman's tranquil Old Order Amish life is transformed when she suddenly has custody of her two teenage nieces after her "English" sister and brother-in-law are killed in an automobile accident. Instant motherhood, after years of unsuccessful attempts to conceive a child of her own, is both a joy and a heartache. Rebecca struggles to give the teenage girls the guidance they need as well as fulfill her duties to Daniel as an Amish wife. Rebellious Jessica is resistant to Amish ways and constantly in trouble with the community. Younger sister Lindsay is caught in the middle, and the strain between Rebecca and Daniel mounts as Jessica's rebellion escalates. Instead of the beautiful family life she dreamed of creating for her nieces, Rebecca feels as if her world is being torn apart by two different cultures, leaving her to question her place in the Amish community, her marriage, and her faith in God. Eighteen-year-old Lindsay Bedford is struggling to figure out where she belongs. In the Amish community of Bird-in-Hand? Or in the English world like her older sister? Returning for an extended visit to her hometown in Virginia, Lindsay must reconnect with old friends, face family pressures, and take some surprising turns before she can truly find her way home.